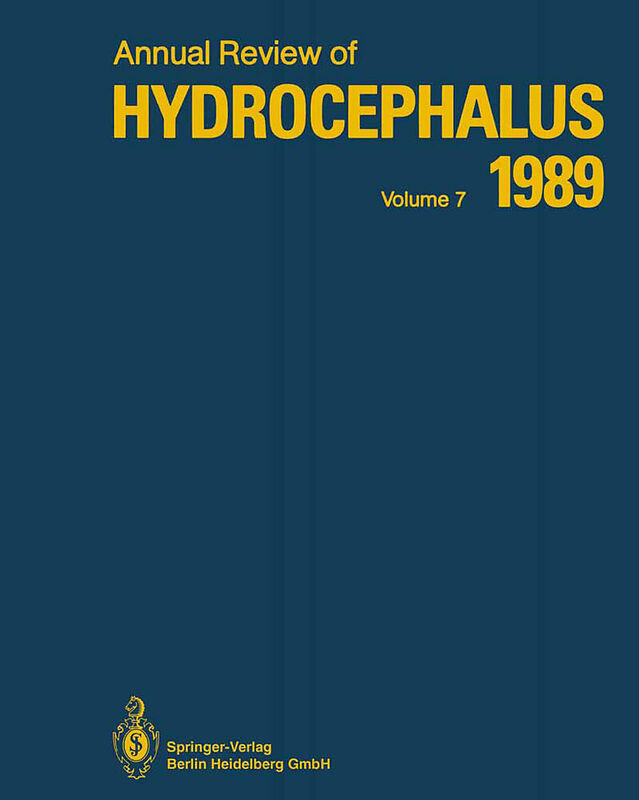 This volume contains 121 representative works on hydrocephalus which are collected from 24 listed journals and books in the field of neuroscience published in 1988. We express OUf sincere thanks to all authors, listed publishers and editorial boards for their cooperation and permission on this publication. 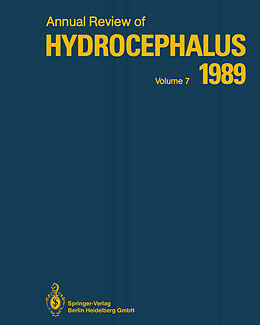 It isour pleasure ifthis book willprovide you with an up-to-date review of the works on hydrocephalus. The editors ACKNOWLEDGMENT Greatful acknowledgments for permission to reproduce copyright material are made to the editors and the publishers listed below: Acta Neurochirurgica: Springer-Verlag, Wien American Journal of Neuroradiology (AJNR): American Roentgen Ray Society American Journal of Psychiatry: The American Psychiatrie Association Archives of Neurology: American Medical Association Brain and Development: (Official Journal) The Japanese Society of Child Neurology Brain Research: Elsevier Science Publishiers B. V. Child&apos;s Nervous System: Springer-Verlag, Berlin CT Kenkyu/Progress in Computerized Tomography: Neuron Publishing Co. Journal of Neurology, Neurosurgery and Psychiatry: British Medical Journal Journal of Neurosurgery: The American Association of Neurological Surgeons Journal of Pediatric Neurosciences: Springer-Verlag, Heidelberg Journal of Pediatric Surgery: Grune & Stratton, Inc. Nervenarzt: Springer-Verlag, Berlin Neurologia Medico Chirurgica (Tokyo): (OfficialJournal) The Japan Neurosurgical Society Neurology: Modern Medicine Publications, Inc. I) Experimental & Basic Studies.- (1) Congenital Hydrocephalus in HTX-rats: Incidence, pathophysiology, and developmental impairment.- (2) The Etiology of the Congenital Hydrocephalus in the Inbred Rat LEW/Jms: Light microscopic study in the embryonic stage.- (3) Experimental Hydrocephalus and Hydrosyringomyelia: Computer tomographic studies.- (4) Neuropathology of Congenital Hydrocephalus in the SUMS/NP Mouse.- (5) A Quantitative Golgi Study of Cortical Pyramidal Neurons in Congenitally Hydrocephalic Rats-HTX.- (6) Morphological Study on Congenital Hydrocephalus of the Inbred Rat, LEW/ Jms: Changes in the cerebral gray matter.- (7) Changes in Periventricular Vasculature of Rabbit Brain Following Induction of Hydrocephalus and after Shunting.- (8) Pseudoventricle Formed in Grafted Neural Tissue and a New Hydrocephalic Model Using the Neural Transplant Method (Part 2).- (9) Changes of Muscarinic Cholinergic Receptors and Cholinergic Neurons in Experimental Acute Hydrocephalic Rat Brains.- (10) Pathogenesis of Cerebral Disturbances on Experimental Hydrocephalus: Transmission and scanning electron microscopic observations in experimental hydrocephalic rats.- (11) Clinical and Ultrastructural Observations of Maturing Human Frontal Cortex: Part 1. Biopsy material of hydrocephalic infants.- (12) Minor CSF Pathways in Experimental Hydrocephalus.- (13) Changes on Blood-Brain Barrier Permeability in Experimental Hydrocephalus.- (14) Cerebroventricular Dilation in Spontaneously Hypertensive Rats (SHRs) Is Not Attenuated by Reduction of Blood Pressure.- (15) Evoked Potentials Produced by the Electrical Stimulation Applied to the Optic Chiasm in the Rat with Asymmetrical Hydrocephalus.- (16) Suppression of Hippocampal Long-term Potentiation in Hydrocephalic Rat.- (17) Evaluation of Brainstem Auditory Evoked Responses in Congenital Hydrocephalus.- (18) Electroencephalographs Findings in Hydrocephalic Children Prior to Initial Shunting.- (19) The Effect of V-P Shunt on Local Cerebral Glucose Utilization in HTX Congenital Hydrocephalic Rats.- (20) Alteration of Atrial Natriuretic Peptide Binding Sites in Rat Choroid Plexus with Experimental Hydrocephalus.- (21) Changes in Intraventricular Pressure and Brain Lipids in Experimental Hydrocephalus.- (22) Quantitative Fatty Acid Composition and Monoamine Metabolites in CSF from Congenital Hydrocephalic Children During the Myelination Period.- (23) Cerebral Metabolism in Hydrocephalic Animals: Comparison of water, electrolytes and energy metabolism in brain tissues between congenital and acquired hydrocephalic rats.- (24) Histochemical Study of Estrogen Receptor in Hydrocephalic Rat Brain.- (25) Spatial Memory Disruption in Hydrocephalic Rats Assessed in the Radial Arm Maze.- II) Pathophysiology.- (1) Establishment of a Cerebrospinal Fluid Bank.- (2) Hydrodynamics and CSF Flow Through a Shunt in Hydrocephalus.- (3) Intracranial Arterial Duplex Doppler Waveform Analysis in Infants.- (4) Treatment of Symptomatic Syringomyelia with a Ventriculoperitoneal Shunt: A case report with magnetic resonance scan correlation.- (5) CSF Pulse Wave, ICP, and Autoregulation.- (6) Relationship Between Plateau Waves and Respiration: Experimental study in kaolin-induced hydrocephalic dogs with normal intracranial pressure.- (7) The Value of Estimating Pressure-volume Index in Childhood Macrocephaly.- (8) Threshold of Cerebral Perfusion Pressure as a Prognostic Factor in Hydrocephalus During Infancy.- (9) Outcome of Pregnancy in Patients with Unexplained Elevated or Low Levels of Maternal Serum Alpha-Fetoprotein.- III) Symptomatology.- (1) Macrocephaly: Definition and classification.- (2) Familial Occurrence of Congenital Anomalies of the Central Nervous System.- (3) Optic Glioma with Progressive Occlusion of the Aqueduct of Sylvius in Monozygotic Twins with Neurofibromatosis.- (4) Benign Intracranial Hypertension Treated with Ventriculoperitoneal Shunting: Case report.- (5) A Hyperthermic Syndrome in Two Subjects with Acute Hydrocephalus.- (6) Sudden Infant Apnea and Insidious Hydrocephalus.- (7) Ventricular and Sulcal Size at the Onset of Psychosis.- IV) Diagnostic Procedures.- (1) Relationship Between Cerebrospinal Fluid Flow Through the Ventriculo-peritoneal Shunt and Computed Tomographic Images of Hydrocephalic Patients.- (2) The Effect of L-threo-DOPS in Metrizamide Encephalopathy with Persistent Consciousness Disturbance and Extrapyramidal Symptoms.- (3) Observation of the CSF Pulsatile Flow on MRI (2): The signal-void phenomenon and its relation to the intracranial pressure.- (4) Consideration of the Diagnosis and Treatment of Fetal Hydrocephalus.- (5) Prenatal Diagnosis of Cysts of the Fetal Choroid Plexus.- (6) Screening of the Central Nervous System in Neonates and Infants with Neurosonography.- V) Therapeutic Procedures.- (1) Ventriculopleural Shunts for Hydrocephalus: A useful alternative.- (2) Subcutaneous Absorption of Cerebrospinal Fluid in an Infant with Hydrocephalus.- (3) An Easily Replaceable Intracranial Catheter.- (4) Conversion of a Lumboperitoneal Shunt to a Lumboatrial Shunt Through Femoral Catheterization: Technical note.- (5) Technical Note: The removal of free peritoneal catheters in the revision of ventriculoperitoneal shunts.- (6) Modified Puncture Needle for Percutaneous Needle Trepehination.- (7) Manometric Ventricular Trocar: A new shunting apparatus with intraventricular fluid pressure monitoring.- (8) Experiences of Shunt Operation with Programmable Pressure Valve in Infants.- (9) Experience with Shunting Operations Using Double Lumen Ventricular Catheters in Hydrocephalic Patients.- (10) Factors Affecting Cerebrospinal Fluid Flow in a Shunt System.- (11) Shunts, Indications, Problems and Characteristics.- (12) Shunt Malfunction in Childhood Hydrocephalus: Classification of malfunction sites in the shunt system.- (13) Causal Factors of Shunt Revisions: With special reference to frequent and immediate revisions.- (14) Analysis of Malfunctioning Shunts in the Management of Hydrocephalus.- (15) Gliomatosis Cerebri Presenting with Hydrocephalus and Dementia.- (16) A Clinical Study on Shunt Revision: Comparison in children and adults.- (17) Ventricular Shunt Functioning Despite Extraventricular Location of the Catheter Tip as Revealed by Computed Tomography.- (18) Function of Parietal and Frontal Shunts in Childhood Hydrocephalus.- (19) Cerebrospinal Fluid Eosinophilia and Sterile Shunt Malfunction.- (20) Treatment of Ventriculostomy-related Infections.- (21) Origin of Organisms Infecting Ventricular Shunts.- (22) Corynebacterium Group JK Pathogen in Cerebrospinal Fluid Shunt Infection: Report of two cases.- (23) CNS Toxicity Associated with Intraventricular Injection of Cefazolin.- (24) Electroencephalographic Findings and Epilepsy in the Slit Ventricle Syndrome of Shunt-treated Hydrocephalic Children.- (25) Slit Ventricle Syndrome with Aqueduct Stenosis: Third ventriculostomy as definitive treatment.- (26) Isolated Fourth Ventricle: Review of seven cases.- (27) Symptomatic Low Intracranial Pressure in Shunted Hydrocephalus.- (28) A Case of Shunt Nephritis and a Review of the Literature.- (29) Cephalhydrohematocele Due to Catheter Valve Disconnection Following Ventriculoperitoneal Shunting.- (30) Traumatic Intratumoral Hemorrhage Secondary to Ventriculoperitoneal Shunt.- (31) Central Nervous Cryptococcosis Giving Rise to Ascites after Ventriculo-peritoneal Shunting: Case report.- (32) Delayed Intracerebral Hemorrhage Following VP Shunt Operation.- (33) Marked Cerebrospinal Fluid Collection Associated with Hepatic Failure.- (34) Peritoneal Cerebrospinal Fluid Pseudocyst: A complication of ventriculoperitoneal shunts.- VI) Follow-Up & Long-Term Result.- (1) Prenatal Hydrocephalus: Outcome and prognosis.- (2) Etiology and Prognosis in Hydrocephalus.- (3) Poor Prognostic Factors for Enlarged Subarachnoid Spaces in Infants.- VII) Individual Form of Hydrocephalus.- (1) Clinical Analysis with 51 Cases of Meningocele and Meningomyelocele, with Special Reference to Hydrocephalus.- (2) Evaluation of Shunt Treatment in Hydrocephalus with Myelomeningocele: Some factors relating to mental prognosis.- (3) Experience with Simultaneous Ventriculo-peritoneal Shunt Placement and Myelomeningocele Repair.- (4) Resolution of Syringomyelia and Chiari I Malformation by Ventriculoatrial Shunting in a Patient with Pseudotumor Cerebri and a Lumboperitoneal Shunt.- (5) A Case of Dandy-Walker Malformation: Consideration on the teratogenic period and sleep structures.- (6) NMR Images of Non-communicating Hydrocephalus Associated with Dandy-Walker Variant and Achondroplasia.- (7) Holoprosencephaly with Dandy-Walker Cyst Diagnosed in Utero by MRI: Report of a case.- (8) A Case of Congenital Unilateral Hydrocephalus.- (9) Neuroradiological Evaluation of Dorsal Cyst Malformations.- (10) To Shunt or to Fenestrate: Which is the best surgical treatment for arachnoid cysts in pediatric patients?.- (11) Postoperative Course of the Size of Arachnoid Cyst in the Middle Fossa.- (12) Approximation of the Split Brain Surface in an Infant with Schizencephaly and Multiple Brain Anomalies.- (13) Hydrocephalus in Craniosynostosis.- (14) Symptomatic Hydrocephalus: Initial findings in brainstem gliomas not detected on computed tomographic scans.- (15) A Case of Neonatal Choroid Plexus Papilloma.- (16) Slow Reduction in Ventricular Size after Removal of Choroid Plexus Papilloma: Case report.- (17) Hydrocephalus and Intraspinal Tumor.- (18) Congenital Intramedullary Teratoma Involving the Entire Spinal Cord and Brain Stem Associated with Hydrocephalus.- (19) The Subcutaneous Ventricular Reservoir: An effective treatment for posthemorrhagic hydrocephalus.- (20) Management of Posthemorrhagic Hydrocephalus in the Extremely Low-Birth-Weight Infant: Treatment with a subcutaneous ventricular catheter reservoir.- (21) Biphasic Ventricular Dilatation Following Posterior Fossa Subdural Hematoma in the Full-term Neonate.- (22) Hydrocephalus after Aneurysmal Subarachnoid Hemorrhage.- (23) The Amount of Blood in CSF and Degree of Hydrocephalus Studied with CT as Compared to Clinical Condition and Concentrations of Various Substances in Human CSF after Subarachnoid Haemorrhage.- (24) Effect of Cisternal Drainage after Early Operation for Ruptured Intracranial Aneurysms.- (25) Hydrocephalus and Vasospasm after Subarachnoid Hemorrhage from Ruptured Intracranial Aneurysms.- (26) Obstructive Hydrocephalus Due to a Giant Aneurysm of the Internal Carotid Bifurcation.- (27) Hydrocephalus and Tuberculous Meningitis in Children: Report on 26 cases.- (28) Acute Hydrocephalus in Infectious Spinal Disorder.- (29) The Diagnosis of Idiopathic "Normal Pressure" Hydrocephalus: Clinical features, CT and epidural pressure recording.- (30) Indications for Shunting in Normal Pressure Hydrocephalus: Time-dependent analysis of EEG and intracranial pressure.- (31) Biochemical Investigation of Normal Pressure Hydrocephalus in the Assessment of Shunt Effectiveness.- (32) Reduction of Ventricular Size after Shunting for Normal Pressure Hydrocephalus Related to CSF Dynamics before Shunting.- (33) Natural History of Subdural Effusion in Infants: Prospective study of 87 cases.- (34) MRI of Subdural Fluid Collection in Infants.- (35) Surgical Treatment for Infantile Subdural Fluid Collections.- (36) Subdural Fluid Collections in Infancy.- (37) Brain Damage Due to Head Trauma in a Patient with Compensated Hydrocephalus: Case report.- Author Index.